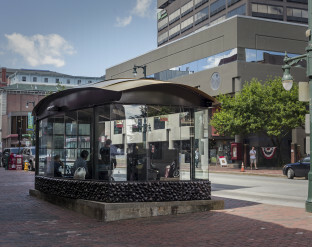 George Kelly, sculptor | Dedicated 1998 | Bronze and Granite | Gorham’s Corner, Intersection of Fore St, Pleasant St, York St. and Center St. 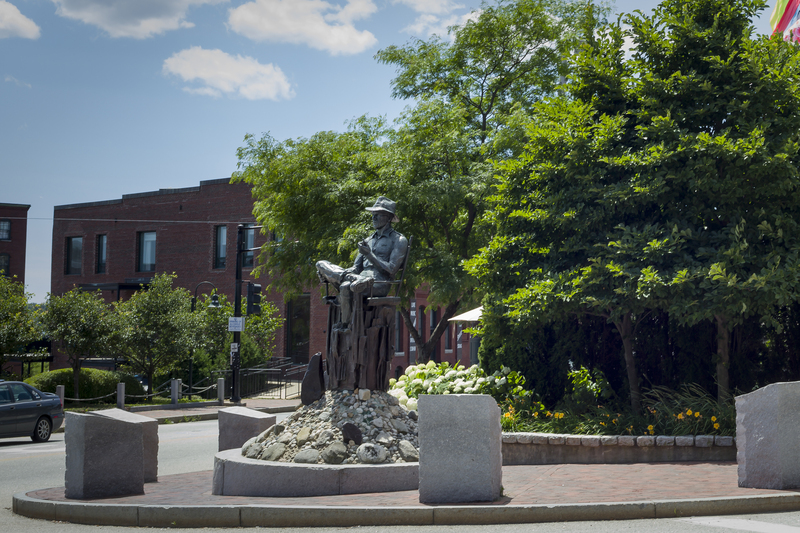 The ten-foot high bronze statue of John Ford, a Portland native who is regarded by many critics and film historians to be the greatest movie director in the history of American cinema, is located in the area known as Gorham’s Corner, a neighborhood once heavily populated by Irish immigrants. 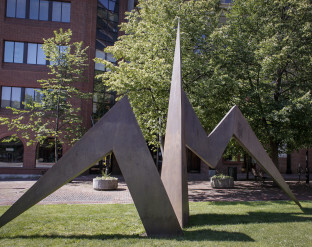 The piece was sculpted by artist George Kelly in his New York studio and dedicated in July 1998. 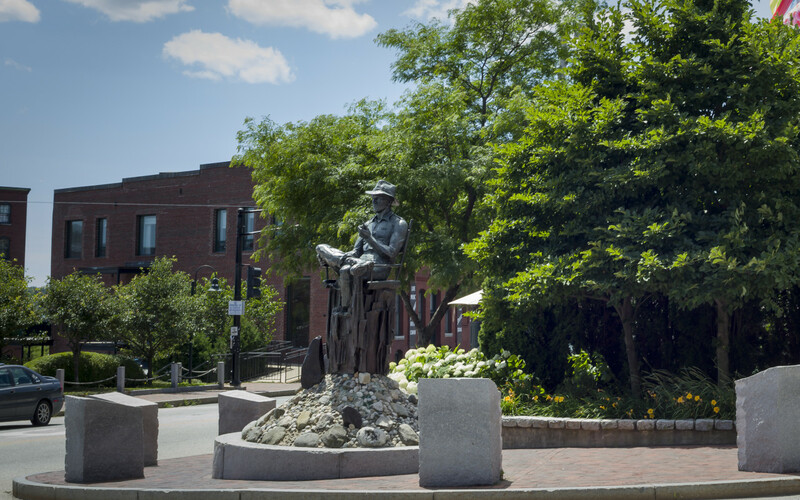 Born John Martin Feeney in Cape Elizabeth on February 1, 1894, Ford moved to Portland with his family when he was a young child and lived on Danforth Street for a short time, not far from the statue, but grew up mostly on Sheridan Street on Munjoy Hill. He changed his last name to Ford in 1914 when he went to Hollywood after his graduation from Portland High School to join his brother Francis, an established actor and movie director in silent films who had taken the last name of Ford when he went to Hollywood some years earlier. Ford first worked as an assistant director on his brother’s films, but in 1917 he began working on his own, making short westerns with silent film star Harry Carey, an association that would launch Ford’s directing career. Their 1924 film “The Iron Horse” established his reputation in the profession. Ford directed one hundred and thirty films over the course of his career, from 1914 to 1965. His 1939 film “Stagecoach” is commonly called the first modern western. Ford received Best Director Oscars for “The Grapes of Wrath” (1940), “How Green Was My Valley” (1941), and “The Quiet Man” (1942). The bronze sculpture depicts a middle-aged Ford sitting in his director’s chair with one leg crossed over the other and his ever-present pipe in hand. The director’s chair sits on a rock base that represents the rock formations of Monument Valley in Utah and Arizona, where Ford shot many of his westerns. Ford looks across Center Street where a pub owned by his father once stood. Ringing the statue are six four-foot high granite blocks, each inscribed with the titles and descriptions of Ford’s six Oscar winning films. Facts from Ford’s life are inscribed in granite at the base of the statue. The impetus for the creation of the statue came from a Louisiana philanthropist named Linda Noe Laine who was a friend of Ford and his wife Mary. Ford was fond of talking about the influence on him of his native city of Portland. 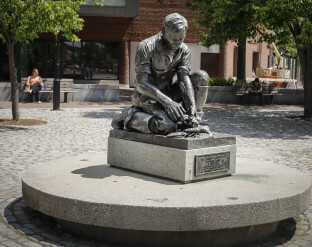 Laine, upon visiting Portland and finding that there was nothing in Ford’s hometown to mark its connection to one of the immortals of American cinema, contacted then-Mayor Jack Dawson and subsequently donated some $250,000 for the creation of this fitting memorial. Emily Pinette – John Ford.VOB from Portland Public Art Committee on Vimeo.